Here is a stunning example of the high art form to which us humble terrarium-makers can strive towards. Lindsay Taylor and collaborators designed this terrarium, which has existed for some time on it's own. More proof that the underlying trick to a successful terrarium is the achievement of a balanced environment for your chosen plants. A lady slipper orchid, moss, ferns, climbing ficus, and other suitable plants have lived together since 2008. Keeping the terrarium clean and free of dead plant matter is important, but, mostly, it takes care of itself. 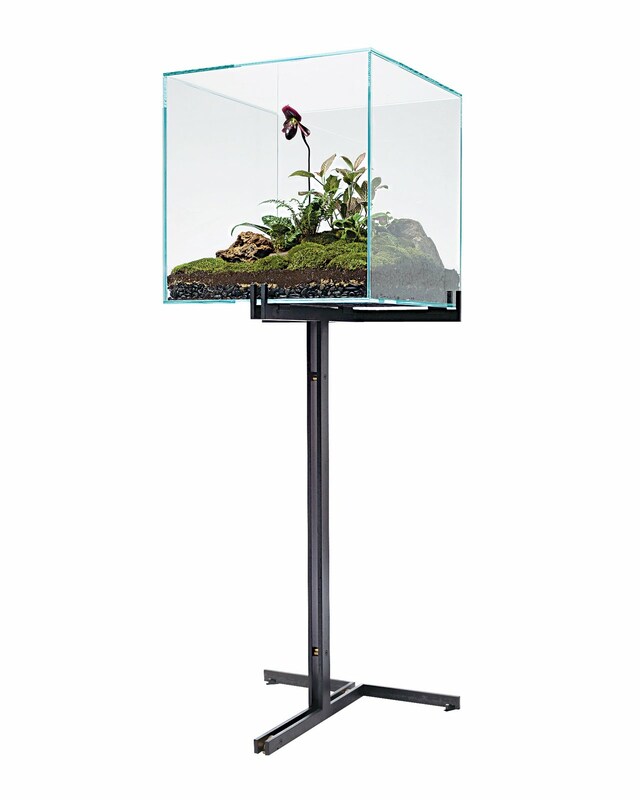 The steel stand has bronze details, including adjustable feet for leveling the piece on uneven surfaces. WOW! Incredibly beautiful- the Ladyslipper itself and the terrarium. Thank you!